Exclusive Features of The ECHELON 1060 are a double wall teardrop style seamless hood with integrated warming rack, watertight woodchip smoker drawer with dedicated burner, recessed all stainless rotisserie back burner, manual ignition tubes and stainless steel valve manifold. The flagship of the Firemagic line. One of the largest cooking surfaces available in a gas grill today! This grill offers a true 48" across the cooking surface, not the FRAME of the grill like others measure. A total whopping BTU rating of 115,000 on the main cooking surface and two 15,000 BTU rotisserie backburners for a combined total of 145,000 BTU's. The total cooking area is 1056 sq. inches so it can hold just about anything you want to load up! Built-in halogen cooking lights. Built-in digital cooking thermometer & timer with meat probe. This grill is equipped with heat"zoned cooking" separators, allowing foods to be cooked at different temperatures. The ECHELON 1060 also features 110 volt electric ignition. The stainless steel cabinet cart features dual storage doors below, inside shelves, condiment holders, a stainless steel prep shelf on each end, tank access (propane models) TWO stainless steel drawers and heavy-duty cart casters for ease of portability. Echelon Slide Show. The ECHELON 1060 ALSO includes a super heavy duty rotisserie kit with stainless steel motor capable of turning just about anything you can put on it! Of course, with a rotisserie you also need a backburner and this unit features TWO of them at 15,000 BTU's each, for independent operation allowing you to rotiss AND grill at the same time. Finally, the ECHELON 1060 cabinet cart model also includes the massive POWER BURNER for another 60,000 BTU's of cooking power! The power burner has two ring burners that are controlled separately so you can easily stir-fry, simmer smaller items or blast away with a seafood boil. THIS unit is truly an outddoor kitchen on wheels! 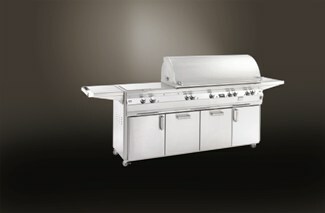 Every Firemagic Gas Barbecue includes the most even heat distribution through cast stainless steel "E" burners. The placement of the burners along with the portholes allows for ease of use and virtually eliminates hot spots and uneven cooking temperatures at the grilling surface. These cast burners are 4 1/2 times thicker than any other stainless steel burner! As such, they are warranted for life! A full 12" deep stainless steel uni-body cabinet also allows enough room for the burners to be placed low enough from the cooking surface to allow the heat to spread evenly before reaching the cooking surface. This cooking evenness is further achieved with the exclusive flavor grid which is a uniquely angled, perforated 16 gauge all stainless steel grid that allows the heat to pass through while radiating the burners heat throughout and across the cooking surface, virtually eliminating hot spots. No porcelain rods to break here! The flavor grid also allows the vaporizing of cooking juices and grease as the drippings hit it. When they vaporize, smoke is generated and you receive the flavor-enhancing smoke that makes cooking outdoors so great! Firemagic grills also feature heavy-duty specially-textured cooking grids that are made of thick 5/16" rod. These grids will last a lifetime and are perfect for cooking many types of food. The textured finish also helps food resist sticking to them.